You can have the kick and snare portions of a Drummer region follow another track so that the beat Drummer plays is influenced by the rhythm of another instrument’s content. You may find, for example, that it makes more musical sense to have the chorus beat influenced by a guitar track, while the rest of the song follows a bass track. You can set this option on a region basis, which means that each Drummer region can follow a different track. Audio files recorded using monophonic, polyphonic, or percussive instruments. Audio files containing notes played on the same beat—no overlapping chord notes. Audio files recorded without distortion, overdrive, compressor, or modulation effects. Note: When using an audio track, be sure to select the Enable Flex checkbox for the track in the Audio Editor. Select a Drummer region in the Tracks area. 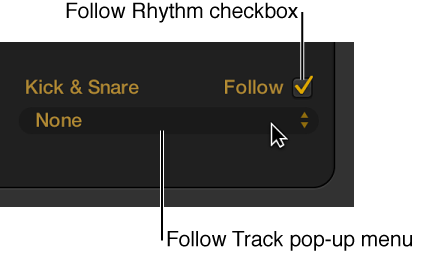 Select the Follow Rhythm checkbox in the Drummer Editor. Because this behavior has an effect on the kick and snare portion of the beat, the Kick & Snare pattern variation slider changes to the Follow Track pop-up menu. Choose a track from the Follow Track pop-up menu. As with other track types, you can also match the timing of a Drummer track to the groove track. For details, see Control timing with the groove track.